The San Francisco-based conference hosted by the cloud software vendor has turned into the flagship annual event for the software as a service (SaaS) industry. Its attendees number well above 100,000 (thanks in part to a free tier of attendance offered that allows access to the expo floor) and it attracts heavyweights from the political, celebrity, and music worlds to deliver keynotes and perform concerts. This year, Michelle Obama and Ashton Kutcher are slated to speak. Alicia Keys and Lenny Kravitz will perform at the “Dreamfest” conference party that sees the entire AT&T park rented out. A serial entrepreneur, Abel is the former CEO of Steelbrick, a configurable price quote (CQQ) web-based software firm that Salesforce acquired in 2016. He departed Salesforce in June after the integration was completed. After years of marketing Steelbrick and his previous startup, BigMachines, he shared his advice on making the most out of your Dreamforce marketing budget with IT World Canada. 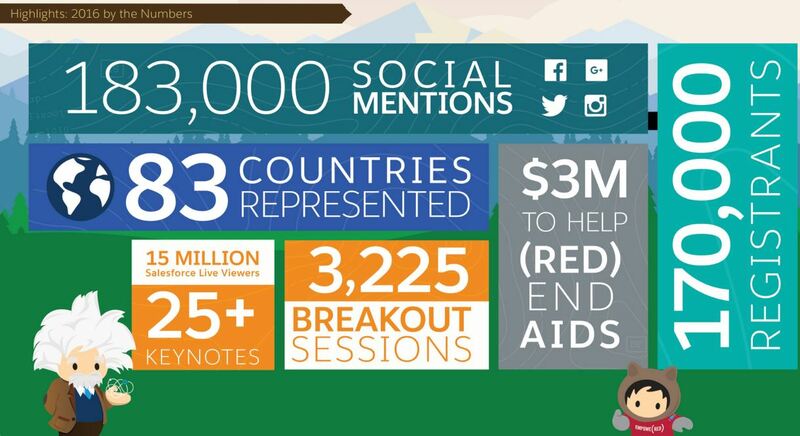 A Salesforce infographic breaks down some Dreamforce 2016 stats. Click on image for a larger view. As the show has become more popular, the price of claiming territory on the massive expo show floor in the Moscone Centre has shot up into the clouds. For 2017 a 6×8 foot booth will run you $25,000, according to Salesforce’s prospectus. That comes with electrical and Internet connections, a monitor, a stool, a wastebasket, a rack for pamphlets, and a badge-scanner device. Prices go up from there, $65,000 for a 10×10 foot booth and $85,000 for a 10×20 foot booth. Abel says it’s worth it. He always opted for a booth for his previous firms and in 2015 he recalls that 32,000 people visited the SteelBrick booth. But he warns that you shouldn’t just show up and expect that your booth will be a success. Rothstein has a different strategy. Rather than scrambling to scan badges that pass by a phone-booth-sized space on the floor, Groove.co is setting up a customer dinner for this year’s Dreamforce. It’s also sponsoring a Happy Hour event at District, a venue that’s near Dreamfest. For less than $8,000, it gets a nice-sized venue to host invited guests. Dreamforce has become such a big event that it’s taken over the San Franciso core. The main street adjacent to the Moscone Centre is entirely closed to traffic, and vendors rent out just about any private space available to host ancillary events, similar to the Groove.co Happy Hour. As a result, booking venues during Dreamforce is challenging. If booking a venue isn’t possible or too expensive, get creative with finding space. Some companies might be lucky enough to have a partner or even a good customer with office space near the conference. Groove.co is working with one of its customers to co-host a “spa space” where haggard Dreamforce attendees can sip a coffee and enjoy a quick massage. Returning to Dreamforce this year with G2 Crowd, Abel says his mission is to collect 3,000 software reviews for the independent user reviews site. He approaches the conference as a sort of alumni reunion. The more aligned your business is with what Salesforce is talking about in its keynote presentations and large industry-track sessions, the more on the ball you’ll look, advises Abel. Last year the big topic was artificial intelligence with the rollout of Einstein. Also, while it’s easy to party all night long (try the DoubleDutch Partyforce app ), that might not be the best plan if you’re looking to make headway for your business. Rothstein provides a simple reminder to “be human” and focus on having real conversations rather than treating everyone you meet like a lead you have to capture. Put down the badge scanner and look people in the eye for a minute. 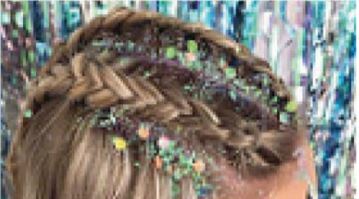 Festival Hair: For $15,000 you can sponsor Dreamforce attendees to have their hair done by on-site cosmetologists. Staff will wear your logo on their shirt while they braid hair. Eyelash Bar: During Dreamfest, a Lash Bar will offer attendees “a variety of fun and and funky lashes.” Again, staff will wear your logo for $10,000. Honor of Ohana: $15,000 to sponsor a lei and flower-crown making station. Festival Face and Body Design: “Put your logo right on the bodies of Dreamfest attendees.” Only $65,000. Giant Frame Photo Op: It’s a big photo frame and attendees will want their picture taken in it. Get your brand on it for $20,000. Giant Chair Photo Op: It’s a big chair and attendees will want their picture taken in it. Only $20,000.